line, which is part of the special collaboration with the acclaimed street artist. Or maybe you will like the Shepard Fairey T-Shirt - Batwing. You can check them all at the Levi's site. the Giant Has a Posse" sticker campaign, in which he appropriated images from the comedic super market tabloid Weekly World News. His work became more widely known in the 2008 U.S. presidential election, specifically his Barack Obama "HOPE" poster. 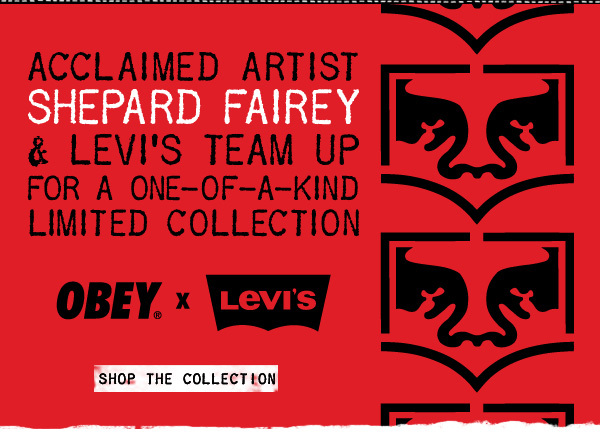 If you didn't venture to Times Square for Shepard Fairey's Levi's promotion on October 29th, here's what you missed. Inside a police barricaded corral, the fictionalizing street artist modeled a jacket from the collection and pasted up a mural celebrating the new corporate collaboration. Following the event, the poster collage was hung up outside the Levi's store, also decked out with Fairey's work, where it will remain for a short time.